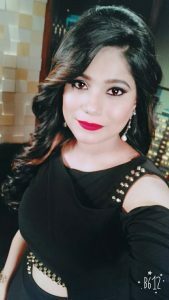 Jyotica Tangri is an Indian playback singer. She first gained fame as a contestant on the Indian singing reality talent show, The Voice. She was also a finalist of Sa Re Ga Ma Pa on Zee Tv. She has playbacked for such films as Behen Hogi Teri, Shaadi Mein Zaroor Aana and Fukrey Returns. In 2018, she won Zee Cine Award for Best Female Playback Singer for the song Pallo Latke. Born in Jalandhar Punjab, India, she is a Guru Nanak Devc University Amritsar graduate with a degree in singing and instrumental music. She debuted as a playback singer in Ajay K Pannalal’s 2017 romantic comedy film, Behen Hogi Teri, through the song, Jai Ma, co-sung by Sahil Solanki. Her first hit song was Kumaar’s Pallo Latke from Vinod Bacchan’s film Shaadi Mein Zaroor Aana. *She was born in Jalandhar Punjab, India. *She was a finalist of Sa Re Ga Ma Pa on Zee Tv. *Her favourite musician are Rahat Fateh Ali Khan and A. R. Rahman.